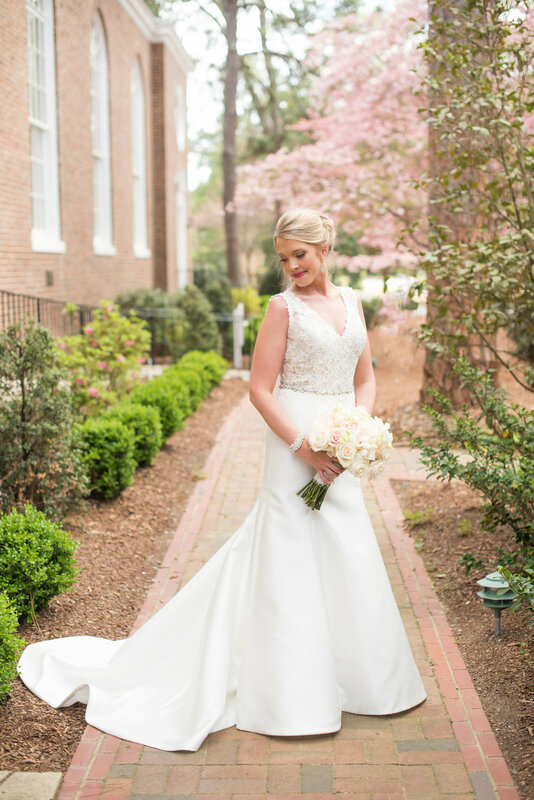 Brady and Lindsey met at the Jefferson Inn in Pinehurst, NC. Brady is in the Air Force and had just moved to Pinehurst while Lindsey had been there for a year as a Speech Language Pathologist. Both were at the Jefferson Inn to grab some drinks with friends when luck stepped in. The couple had mutual friends that introduced them that night and they instantly hit it off. Fast forward a couple of years to when Brady surprised his future bride with a perfectly romantic proposal in Charleston, SC. After a carriage ride around the historic city, Brady had roses, candles, and a guitarist playing their favorite song at a waterfront park. A quick pop of the question and the couple became engaged! Their early spring wedding was a perfect day, according to Lindsey. She wore a classically beautiful Monique Lhuillier gown for their ceremony, one that was filled with happy tears, lots of laughs, and important family members. Brady’s daughter, McKenna, was included in their ceremony and the couple had their own vows written for her. The couple’s reception was a fantastic party filled with a signature drink, The Pinehurst Palmer, a live band, Bounce, and a late night taco bar! We’re so happy for you Brady and Lindsey. Thank you for sharing your special day with us!